This was a season which many fans feared Hibs would never see. By the end of it some might have been wishing they’d never seen any of it themselves. Instead of leaping Lazarus-like from the grave and letting the sheer joy of being alive suffuse our football with carefree abandon, we emerged from the summer’s trauma to plod through the season like stupefied zombies, more undead than alive. Hibs ended in ninth place, having scored the pitiful total of 24 goals in 36 games. It was not until 28 January that we managed to score more than a single goal in a game. 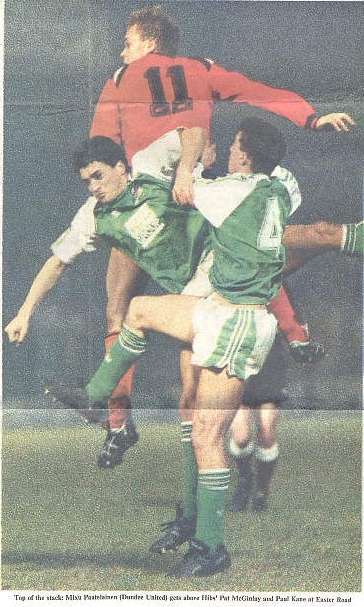 A 2-0 away defeat of Clyde in the Scottish Cup proved to be the first of only four games when we managed two or more scores within the 90 minutes. We were the Treble-Chance Kings with more draws than any other team. 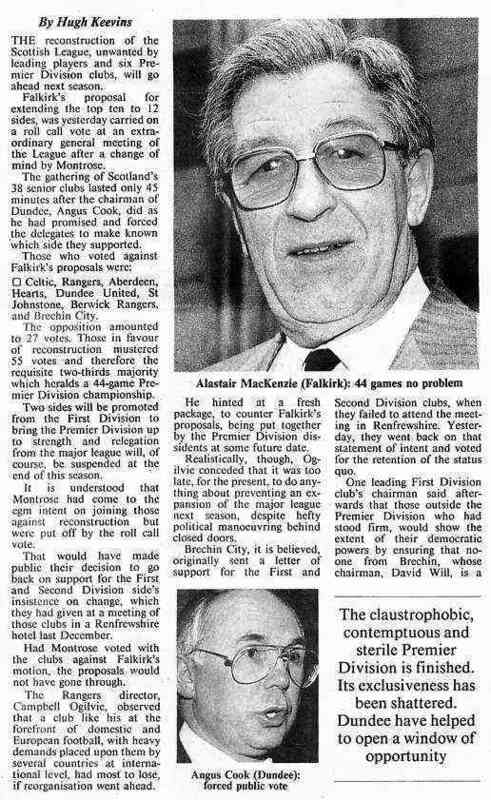 And we suffered two humiliating defeats from Hearts at Easter Road, doubly painful in the aftermath of the takeover bid when every Hibee wanted to rub Wallace Mercer’s smug Tory pus in the dirt. And then bury him in it. There were scarcely any highlights to celebrate, if our continuing existence was excluded from reasons to be cheerful. The expansion to a 12-team premier league and the suspension of relegation was decided at the beginning of February, rendering the remaining thirteen fixtures utterly meaningless. Crowds understandably plummeted, hitting a low of 3,791 for the visit of Dundee United in April. The end of the season that nearly never was couldn’t come quick enough for most. Categories: hibLOG season by season | Tags: 1990-91, league reorganisation | Permalink. 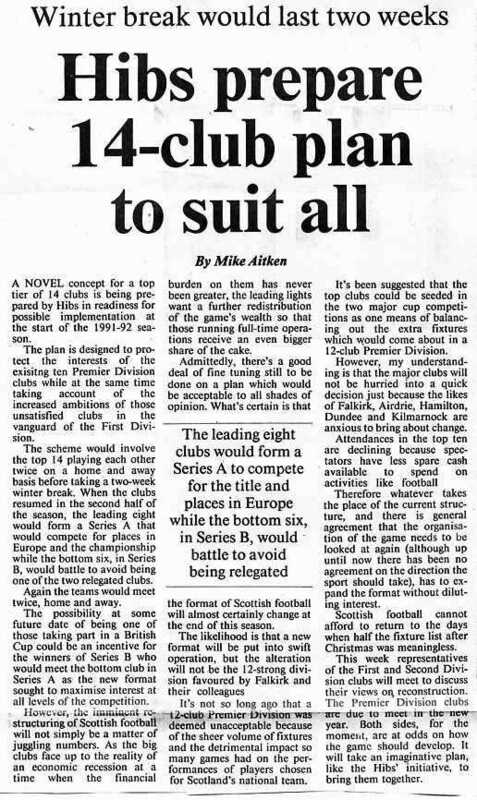 Of more interest than the details of this game (apart from the sight of Mixu doing his stuff in the Arabs’ number 11 shirt) was the report below of Hibs’ proposals for league reconstruction. Cynics would observe that Hibs were only two points off the bottom of the Premier League at this point, having scored a measly 9 goals in 17 matches. Mind you, having said that we were only three points behind Celtic in 5th place who lost 2-1 at home to Dunfermline on this day. Nevertheless it is interesting to note that it took over ten years for ‘the split’ to become reality. Also interesting is the comment that attendances were in decline because spectators have less cash to spend on activities such as football. Has it also taken more than ten years for the powers that be to realise this fact as well? 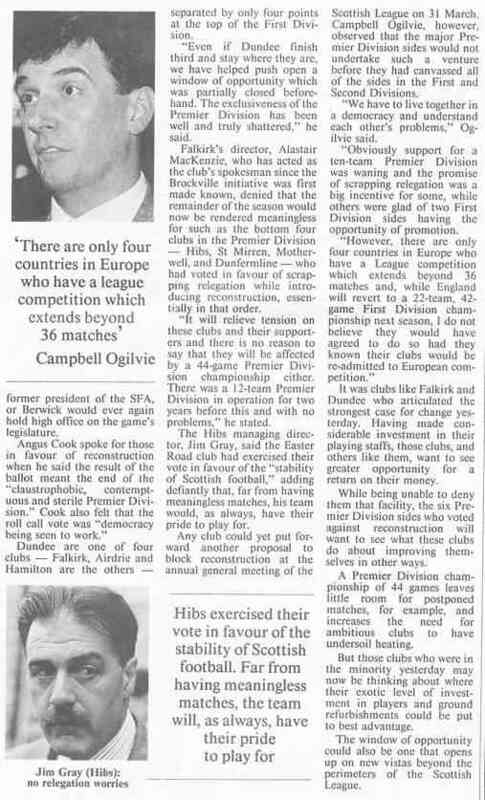 Categories: Press cuttings | Tags: Dundee United, league reorganisation, Mixu Paataleinen | Permalink. 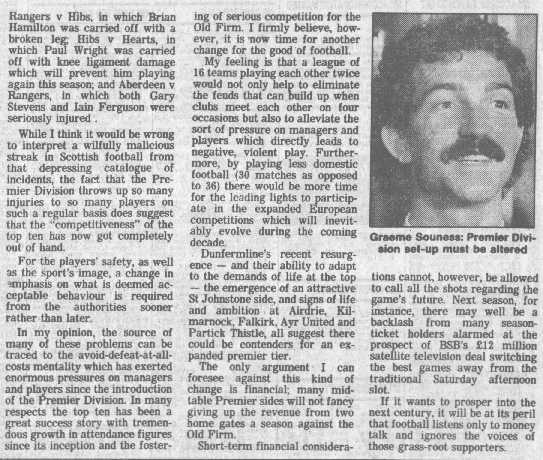 Well, it wasn’t quite the plan that Hibs had come up with back in December, but it had the desired effect as far as they were concerned – no relegation. It is hard to argue that the resultant 44-game league was of great benefit to anyone except the clubs like Falkirk who would have the opportunity to bank half a dozen decent gate receipts. Angus Cook’s comments (below) look particularly laughable in hindsight. 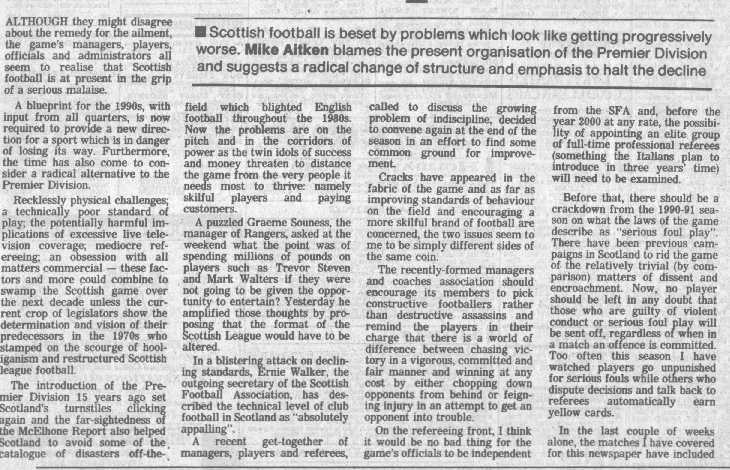 Jim Gray, amazingly still on the Hibs board at this point, tried not to sound completely hypocritical in justifying his club’s vote. No relegation worries says the caption, but he can’t help looking like a man escaping the scene of a crime. Wallace Mercer was, not surprisingly, quite forthright. The last two paragraphs of the piece below resound with echoes of future events and even the current debate for a 16 team Premier league. There is indeed nothing new under the sun it appears. Categories: Press cuttings | Tags: Angus Cook, Campbell Ogilvie, Jim Gray, league reorganisation, Wallace Mercer | Permalink. 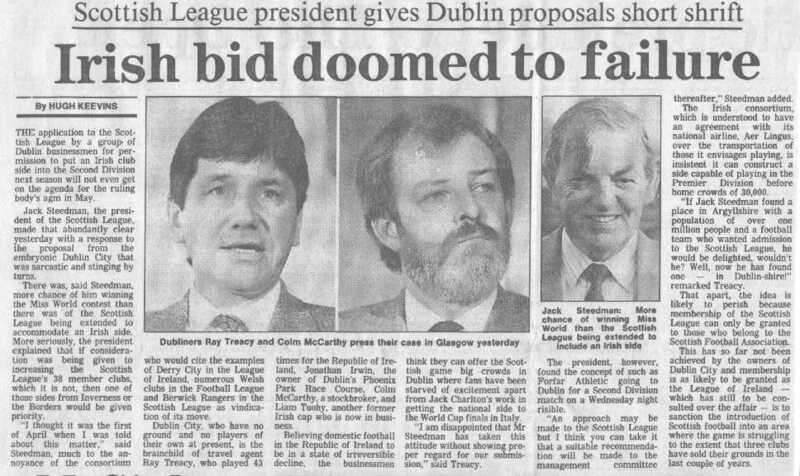 Categories: Press cuttings | Tags: Dublin City, Jack Steedman, league reorganisation | Permalink. Categories: Press cuttings | Tags: league reorganisation | Permalink.